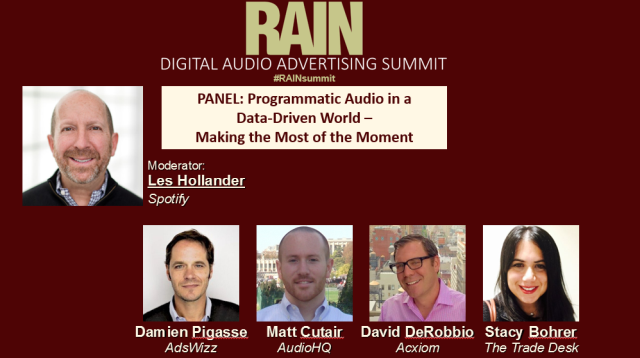 Les Hollander began the session by asking each panelist for the most common questions asked by broadcast buyers about audio programmatic. Damien Pigasse observed that buyers’ first step is to use programmatic as a force for automation — though programmatic values go beyond just efficiency. Hollander asked each panelist for a 20/20 vision of programmatic in the year 2020. “Everyone who touches the strategy, from the creative to the execution, sitting at the same table” — that was the ideal scenario for Stay Bohrer. David DeBarrio predicted “more tailored messaging,” improving existing capabilities of matching message to recipient. Damien Pigasse said that more audio devices in the home would provide interesting new sources of listener data.